grayl-bottlesAs the UN warned a few months ago about the growing clean water shortage in the world, and as the fracking industry threatens even more the supply of clean water and their price, the challenge of supplying drinking water to the 9.5 billion people expected to live on this planet by 2050, is just getting bigger. Perhaps as a response to these challenges, it seems that more and more companies are spending money and time trying to find creative solutions to this problem. Perhaps it should not be the free markets that are the one to solve this challenge, but they do come up with some nifty devices and technologies. One of these is the The Grayl Water Filtration Cup. It looks like a typical water bottle, but it's actually something quite different: a dual-walled cup that you can use to scoop water, filter out impurities and pathogens that threaten to make you sick, and drink out of, all in seconds. The Seattle-based start-up formed last year, created a double-walled container similar in design to a coffee press. Instead of coffee grounds, it filters out pathogens and impurities. The mesh filter system is contained in the base of the inner cup, and all one has to do to filter water is fill the outer cup and push the inner cup down inside it. The water passes through the filter and is safe to drink once the inner cup is pressed fully down and filled with water. There's no sucking, pumping or UV-zapping. Grayl's filtration technology is also a little different than some competitors. Its three-layer G3+ Filter uses an electroadsorption process that's created from a triple ion-charged mesh matrix laid over top its relatively large pores. This mesh serves as a sort of pathogen magnet, pulling bacteria, protozoa and viruses out of the water. 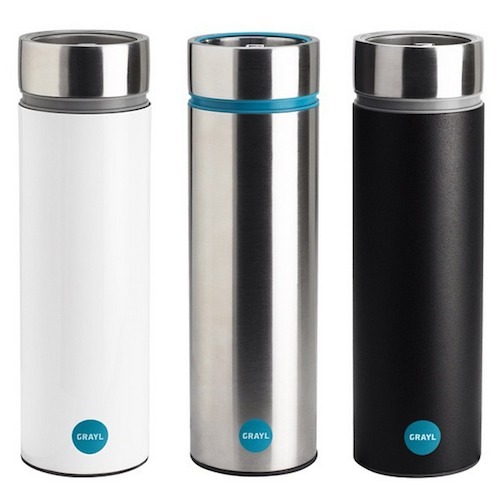 Meanwhile, the carbon layer pulls out metals, chemicals, odors and flavors to give the water a clean taste, and the anti-microbial layer inhibits bacteria, mold, fungus and mildew growth between uses. The filter lasts for up to 300 uses. For areas where viruses are a concern, Grayl also offers the G3+ Purifier, which adds an additional layer for targeting all viruses. The company says that it takes about 15 seconds to push 450 ml of water through the filter and 20 seconds to push it through the purifier. The stainless steel Water Filtration Cup is available for pre-order $69.95, which includes the filter. Additional filters are priced at $19.95 and purifiers at $39.95.